Normal sleep in infancy is a time of change with alterations in sleep architecture, sleep duration, sleep patterns and respiratory control as an infant grows older. Interactions between sleep and respiration are key to the mechanisms by which infants are vulnerable to sleep disordered breathing. This review discusses normal sleep in infancy, as well as normal sleep breathing in infancy. Sleep disordered breathing (obstructive and central) as well as disorders of ventilatory control and infant causes of hypoventilation are all reviewed in detail. Sleep is a distinct physiological state with changes in brain activity, muscle tone and autonomic function (cardiac and respiratory control) as compared with wakefulness. Sleep architecture, total sleep time and sleep staging differ considerably as one transcends from fetal life to adulthood, with a further set of changes to the way we sleep occurring as one heads towards senescence. Sleep and breathing are intrinsically related functions, and this relationship is critical to the understanding of sleep disordered breathing in infancy. Sleep is characterised by a series of sleep stages. The scoring of sleep stages was first proposed for adults in 1968 by Rechtschaffen and Kales  who published a scoring manual. This manual dichotomised sleep stages as rapid eye movement (REM) sleep or non-rapid eye movement (NREM) sleep. NREM sleep was further divided into stages 1–4 based on electroencephal­ography (EEG) characteristics. The Rechtschaffen and Kales scoring system has been superseded by the American Academy of Sleep Medicine (AASM) guidelines , which are used for scoring ­worldwide and divide sleep stages as R (REM), N1 (stage 1 NREM), N2 (stage 2 NREM), N3 (stage 3 and 4 NREM sleep combined, also known as slow-wave sleep) and N (non-REM indeterminate stage). The visual scoring rules for sleep staging in children are applicable from the age of 2 months post-corrected gestational age onwards. Figure 1 demonstrates the appearances of N3 and REM sleep in a child aged 8 years. In addition to the staging of sleep, the AASM guidelines are used for the scoring of respiratory events be they obstructive (apnoea or hypopnoea), central (apnoea or hypopnoea) or mixed, which occur with an associated arousal, awakening or desaturation. Rules are available from infancy onwards to facilitate scoring of respiratory events . 30-s epochs of EOG, EEG, EMG and electrocardiography (ECG) illustrating a) N3 sleep and b) REM sleep in a child undergoing polysomnography. Images courtesy of the Dept of Cardiac, Respiratory and Sleep Physiology, Royal Hospital for Sick Children, Edinburgh, UK. The scoring of infants sleep staging is more difficult due to immaturity in the EEG pattern, such that a dichotomy between active sleep and quiet sleep was proposed by Anders et al. in 1971. An indeterminate sleep stage is used for epochs that display characteristics of both active sleep and quiet sleep. In early infancy the distinction between active sleep and quiet sleep cannot be made on EEG criteria alone, and behavioural and respiratory correlates will change with age. Indeed sleep stage scoring systems exist for infants that are independent of  or complementary to  electrophysiological measures. Active sleep shares some similarity with adult REM sleep (irregular heart rate and EEG, rapid eye movements and reduced electromyography (EMG) activity/muscle tone). In addition, squirming, grimacing and small movements of face and limbs may be noted. Respiration is irregular. Quiet sleep appears similar to adult NREM sleep (high voltage EEG that may be continuous or discontinuous: tracé alternant), with eyes closed, few movements and a regular respiratory pattern. 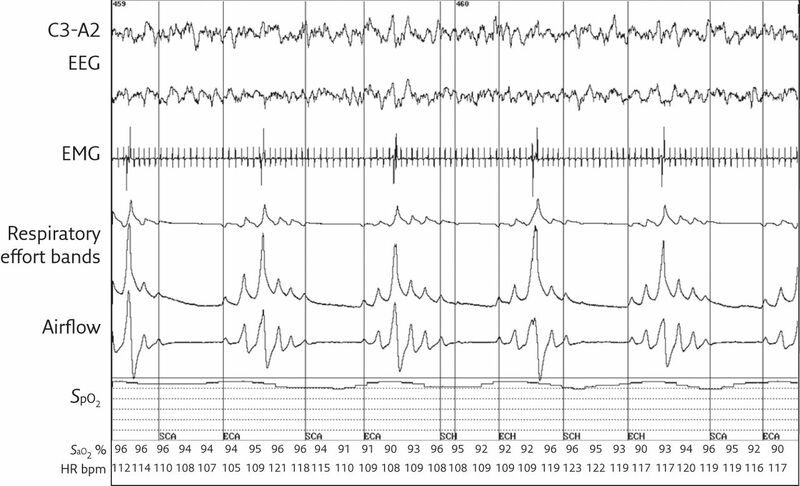 Figure 2 demonstrates the appearances of tracé alternant in an infant undergoing polysomnography. 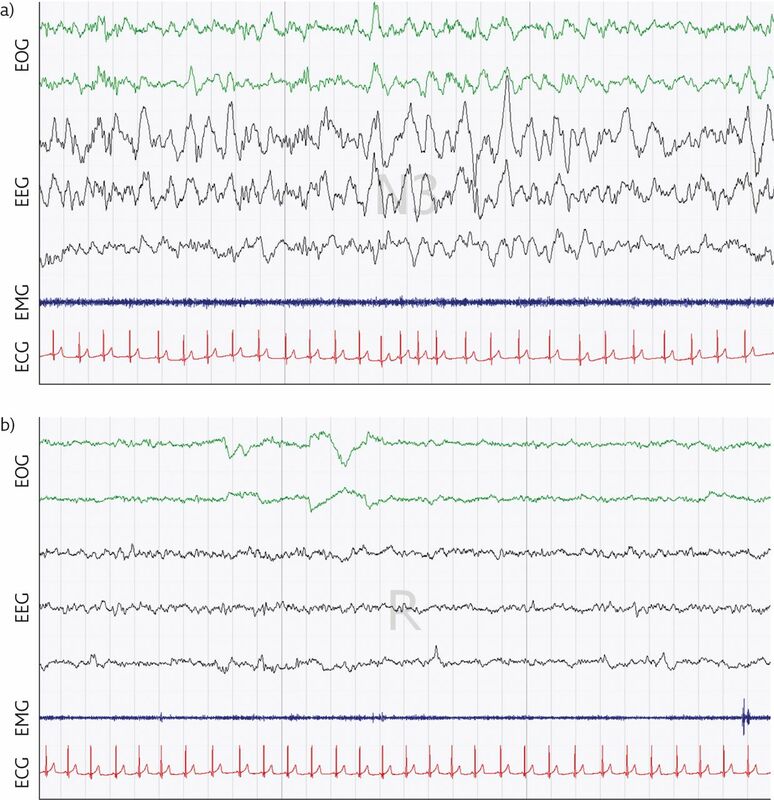 Discontinuous slow wave EEG activity (tracé alternant) in infantile NREM sleep. Image courtesy of Dr Sadasivam Suresh, Dept of Paediatric Respiratory and Sleep Medicine, Lady Cilento Children’s Hospital, Brisbane, Australia. Infant scoring has been incorporated into the most recent version of the AASM scoring guidelines  such that active sleep is named R (REM sleep), quiet sleep is named N (NREM sleep) and ­indeterminate sleep is named T (transitional sleep). These guidelines recommend the use of a combination of behavioural characteristics and characteristics of respiration as well as EEG, electro-­oculography (EOG) and chin EMG patterns. During stage R, the eyes are closed with REM seen under closed eyelids along with grimacing, squirming, sucking and small face and limb movements. ­Respiration is irregular during stage R sleep with some central pauses apparent. Stage N sleep is characterised by the eyes being closed with few movements and a regular respiratory pattern. Stage T sleep is scored when both REM and NREM characteristics are present within the same sleep epoch . Periods of cycling activity interspersed with ­periods of inactivity are identifiable in the human foetus from 28–32 weeks of pregnancy that suggest human sleep is an entity by this gestational age . However, in the post-natal setting active sleep emerges as a recognisable entity at around 28–30 weeks gestational age, whilst quiet sleep begins to become apparent much later (around 36 weeks) . From this point onward quiet sleep increases in proportion so that by 3 months corrected gestational age it is the dominant sleep state . Over this first 3 months of life, many physio­logical functions become more organised. As highlighted above, sleep architecture is one of these, as are pattern and control of breathing. Breathing patterns become more stable with increasing maturation with a reduction in variability of tidal volume as well as a fall in respira­tory rate also occurring throughout infancy . In addition, both tidal volume and inspiratory time increase from preterm through infancy and beyond. Periodic breathing is characterised by recurrent central apnoea and intermittent respiratory effort (figure 3). This is a normal phenomenon in both term and preterm infants, which is thought to reflect immaturity in breathing control . Periodic breathing is common in stage R sleep, but may also occur rarely in N sleep. Periodic breathing may be exaggerated or persist for longer in those who are born preterm, or in those with coexisting pathology (i.e. low birth weight). There are some associations between periodic breathing and prolonged apnoea , as well as evidence that hypoxia precipitates periodic breathing and increase apnoeas in infants close to term . This may explain the demonstrable effects on ­ventilatory control and witnessed apnoeas that result in infants with intercurrent respiratory infections. Furthermore, oxygen appears to be a stabiliser of respiratory control with reduced numbers of apnoeas and a reduced percentage of periodic breathing noted in infants supplemented with oxygen . Periodic breathing in an infant. Image courtesy of Dr Sadasivam Suresh, Dept of Paediatric Respiratory and Sleep Medicine, Lady Cilento Children’s Hospital, Brisbane, Australia. There is considerable variability in arterial oxygen saturation measured by pulse oximetry (SpO2) in infants. Cross-sectional work demonstrates the wide variability in SpO2 measurements in preterm infants with median (range) SpO2 values of 95% (92–99%) , while two longitudinal studies [13, 14] show how SpO2 variability reduces and average SpO2 increases with age. The CHIME study  assessed infants over the first 6 months of life, demonstrating that while median baseline SpO2 values were 97.9%, the 10th percentile was at 95.2%. Furthermore, 59% of the cohort had at least one desaturation to >10% below baseline with median lowest SpO2 values of 83% (10th percentile 78%). Longitudinal work from ­Terrill et al. in Brisbane reported a cohort of 34 infants studied at 2 weeks, and then 3, 6, 12 and 24 months of age. Median SpO2 at 2 weeks of age was reported as 97% (fifth centile 95%), and by 12 months the median SpO2 had risen to 99% (fifth centile 97%) . The scoring of respiratory events in infancy  requires the event to last for at least two breaths. An obstructive apnoea is scored when airflow is absent for more than two breaths despite on­going or increased respiratory effort. An obstructive hypopnoea is scored if there is a >30% reduction in airflow with maintained or increased respiratory effort and an associated desaturation (≥3% drop in SpO2) or an arousal. A central apnoea is scored if there is an absence of both airflow and inspiratory effort along with an associated desaturation (≥3%), arousal, awakening or bradycardia (heart rate <60 beats·min−1). A central hypopnoea is scored if there is a >30% reduction in airflow with reduced respiratory effort and a ≥3% desaturation or awakening. Whilst obstructive apnoeas are rare in healthy infants, the finding of some central apnoeas in sleep studies undertaken on healthy infants [15, 16], and indeed older children [17–19], is normal. These are seen to reduce in number with age [15–18]. Upper airways obstruction in infancy may give rise to repeated, episodic reduction or cessation of airflow (hypopnoea/apnoea), a phenomenon known as obstructive sleep apnoea (OSA). Respiratory effort is preserved or increased at times of apnoea, as the subject attempts to overcome obstruction. The infant is particularly vulnerable to obstruction due to anatomical considerations (face shape and obligate nasal breathing) and the predominant REM sleep state, which may exacerbate obstruction due to loss of muscle tone. In infancy, causes of OSA are predominantly anatomical for example those with laryngomalacia [20, 21], macroglossia  or craniofacial disorders [20, 21] such as craniosynostoses (Crouzon’s disease, Apert syndrome and Pfeiffer syndrome) , subjects with cleft palate and Pierre–Robin sequence (PRS) , those with mid-face hypoplasia (e.g. Treacher–Collins and Goldenhar syndromes)  and those with choanal atresia/CHARGE association . Muscle tone may also be a factor, for example in infants with Down syndrome or neuromuscular disease . In young children, adenotonsillar hypertrophy becomes the principal cause of OSA with adenoids and tonsils increasing in size until ∼2–6 years of age prior to involution. Infantile OSA due to adenotonsillar hypertrophy is, however, a well-­recognised entity and may be present in older infants from ∼6 months of age onwards . It is believed that the sleep fragmentation and intermittent hypoxia ensuing from repeated obstruction and arousal is deleterious to cognition and behaviour in older children with OSA [27–29], although direct evidence for adverse effects of OSA in infants is lacking. Furthermore, growth hormone is secreted during slow wave sleep  and its secretion may be reduced if sleep is fragmented due to OSA. This combined with increased calorie use in infants with OSA may have a dele­terious effect on growth . If we are to extrapolate this evidence to infancy, then it is reasonable to postulate that untreated OSA may be interfering with an infant’s growth and cognitive development at a critical stage. The identification and management of upper airways obstruction will vary depending on the setting (home or hospital) and the equipment available. 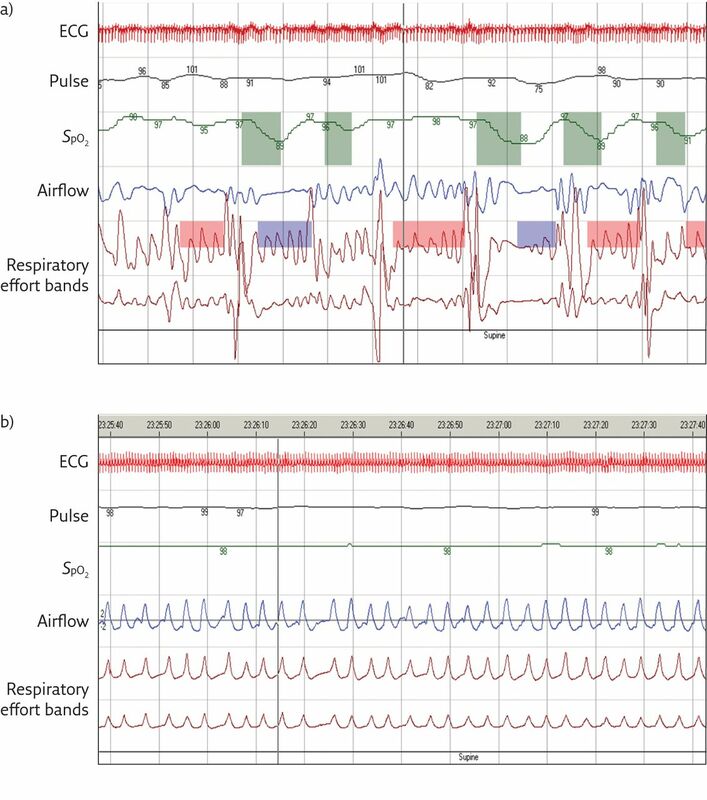 This may vary from bedside observations with measurement of oxygen saturations by pulse oximetry (SpO2) to limited-channel sleep recordings through to full polysomnography. In our ­centres, the majority of sleep studies ­performed are limited-channel cardiorespiratory studies, utilising a video camera, airflow measures (either nasal cannulae or thermistor), respiratory inductance plethysmography bands (to measure respiratory effort), as well as heart rate and SpO2 monitoring. This allows confident detection of apnoea, delineation between central and obstructive events, and quantification of the degree of ensuing hypoxia with obstructive events. Figure 4a is of a sleep study illustrating obstructive events in an infant with upper airways obstruction secondary to PRS. a) Limited-channel cardiorespiratory sleep study delineating obstructive apnoeas in an infant with PRS. b) Resolution of apnoeas with an NPA in situ. Images courtesy of Dept of Cardiac, Respiratory and Sleep Physiology, Royal Hospital for Sick Children, Edinburgh, UK. Management will vary depending on the underlying cause for the obstruction. Laryngeal anom­alies may be amenable to surgical interventions, for example supraglottoplasty for severe laryngomalacia , while tongue reduction may be of value in those with Beckwith–Wiedemann syndrome and macroglossia. Infants with OSA occurring as a result of adenotonsillar hypertrophy will benefit from adenotonsillectomy . In babies with PRS, a small chin (micrognathia), cleft palate and a posteriorly placed tongue predispose the infant to obstruction. A nasopharyngeal airway (NPA) fashioned from an endotracheal tube is often used to bypass upper airways obstruction in this patient group , as demonstrated in the sleep study shown in figure 4b. 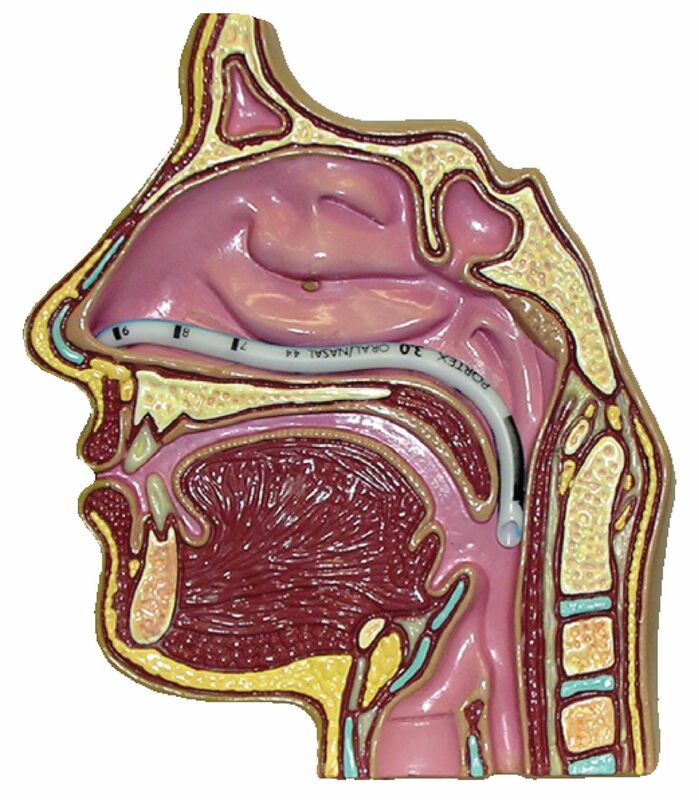 The NPA is sited with the tip of the endotracheal tube lying above the laryngeal apparatus (figure 5). Similarly, the use of pre-cut nasal stents can be used to ­maintain airway patency in those operated on for choanal atresia, with stents providing airflow from the nares to the larynx as well as a conduit for suction . Other treatment modalities may be utilised in the management of PRS, for example ­tongue–lip adhesion , mandibular distraction techniques , continuous positive airway pressure (CPAP) and, as a last resort, tracheostomy. Use of an NPA in the management of infants with upper airways obstruction. Image courtesy of Gordon Williams, Dept of Paediatric Respiratory and Sleep Medicine, Lady Cilento Children’s Hospital, Brisbane, Australia. The use of CPAP may have a role in some causes of infantile upper airways obstruction . De­livered by either nasal or full face mask this modality is especially useful in children with craniofacial disorders. Tracheostomy has a role in some cases of upper airways obstruction, in particular those with multilevel obstruction . Examples of this would include complex PRS, where case series ­report tracheostomy rates as high as 13% . A 10-year retrospective review of 105 infants with PRS managed in Edinburgh  showed that 63% required an intervention with positioning and/or NPA being successful in the majority. Small numbers required surgical intervention with 3% requiring tongue–lip adhesion and 4% undergoing a tracheostomy. Central apnoeas represent a cessation of airflow secondary to the absence of respiratory effort. Infrequent central apnoeas are found in normal children [15–19], in particular following a sigh. Infants are vulnerable to central apnoea because of the wide variability in ventilatory control at such a young age. Hypoxic ventilatory responses are immature such that the principal determinant for ventilatory drive in infants is the carbon dioxide level. If an arousal or a desaturation causes an infant to increase ventilation (in order to restore normoxia), then the infant may overshoot (due to reasons of immature respiratory control) and lower their carbon dioxide tension (PCO2) level to below eupnoeic level reaching the “apnoea threshold” and thus stop breathing (while waiting for PCO2 to rise). However, the infant has low functional residual lung capacity (FRC), and as such does not have to be apnoeic for long before a fall in SpO2 ensues. The resultant desaturation event triggers an increase in ventilation and the cycle starts once again. It is postulated that this mechanism underlies the exaggerated periodic breathing and frequent central apnoeas seen in some infants. It would also explain the stabilising effect of oxygen on breathing regulation, which acts to break this cycle by prevention of the reactive desaturation. There are some cases where the number of central apnoeas and/or the gravity of associated desaturations are felt to be pathological. Such patterns may be related to immaturity of respiratory control and are associated with prematurity  as well as certain medical conditions such as Prader–Willi syndrome . Finally, some infants will have central apnoeas as part of a central hypoventilation disorder, causes for which may be inherited (congenital central hypoventilation syndrome)  or acquired (for example as a consequence of an Arnold–Chiari malformation , brain tumour or spinal injury). The identification of central apnoea relies on sleep studies with measures of airflow (to detect apnoea), effort (to delineate whether central) and SpO2 to allow the number and effect of central apnoeas to be quantified. 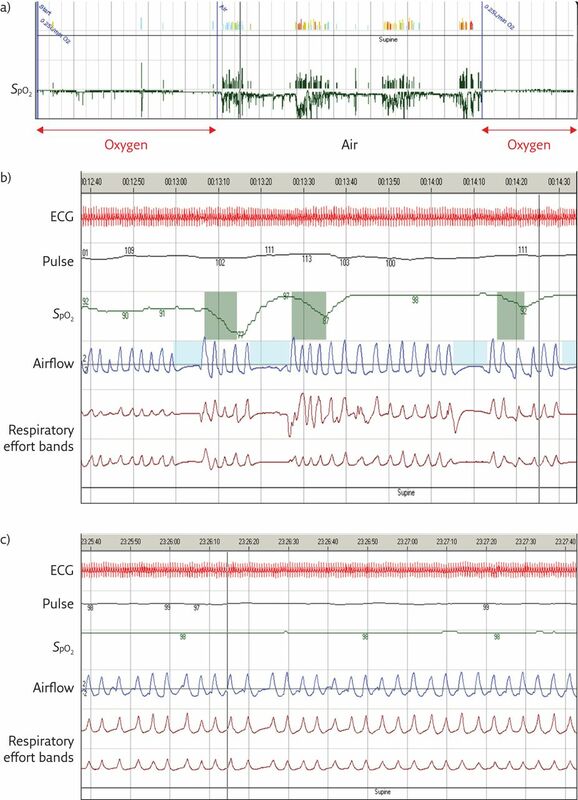 In addition, simultan­eous monitoring of carbon dioxide (via transcutaneous or end-tidal methods) allows for assessment of hypoventilation in those with central sleep disordered breathing. Treatment approaches to central apnoea in infancy include the use of respiratory stimulants (methylxanthines), as well as stabilisers of respiratory control (oxygen with or without ventilatory support). Methylxanthines (caffeine and theophyllines) have been used mainly for treatment of central apnoeas in premature infants, the so-called “apnoea of prematurity”. A recent meta-analysis spanning five trials and a total of 192 babies reported a reduction in apnoeas as well as a reduced need for ventilation in the first week of life .The use of these agents has been extrapolated to older children with central apnoeas, although ­little evidence other than a small number of reported cases exists to support this strategy. The role of hypoxia as a trigger for periodic breathing and central apnoea in infants is well described , while oxygen therapy in infants leads to a reduction in the number of central apnoeas and abolition of periodic breathing [11, 43]. Figure 6 illustrates the effects of oxygen therapy in an infant born at 33 weeks gestation who presented at 2 months of age with idiopathic central apnoea; he subsequently attained a regular breathing pattern and outgrew the need for oxygen. A reduction in central apnoeas with oxygen treatment has also been reported in infants with Prader–Willi Syndrome . Idiopathic central apnoea (immaturity of respiratory control) and response to oxygen therapy in an infant with central apnoea. a) Hypnogram. b) Sleep study in air. c) Sleep study in oxygen at 0.25 L⋅min−1. Images courtesy of Dept of Cardiac, Respiratory and Sleep Physiology, Royal Hospital for Sick Children, Edinburgh, UK. A number of discrete conditions that lead to abnormal breathing control have been identified. The most common of these is congenital central hypoventilation syndrome (CCHS), also known as “Ondine’s curse”. Others include Prader–Willi syndrome, Joubert’syndrome and some of the oral–facial–digital syndromes that also predispose to abnormal control of breathing. CCHS is a disorder of autonomic dysregulation characterised by alveolar hypoventilation that is most marked in NREM sleep . >90% cases are due to a polyalanine repeat mutation in the paired-like homeobox 2B (PHOX2B) gene on the short arm of chromosome 4. The wild-type PHOX2B gene has 20 repeats with CCHS genotypes from 20/24 up to 20/33 identified, with the commonest CCHS genotypes being 20/25, 20/26 and 20/27. The greater the polyalanine expansion size, the more severe the CCHS phenotype and the more likely the need for continuous ventilatory support. ∼10% of CCHS cases are due to non-­polyalanine repeat mutation mutations (missense, frameshift and nonsense mutations) . Individuals with CCHS lack the chemoreceptor sensitivity to respond to hypoxaemia and/or hypercarbia, and have low tidal volumes and a metronomic respiratory rate during sleep despite being challenged by falling oxygen saturations or rising PCO2. Other concomitant autonomic dysfunction may be present including Hirschsprung’s disease, cardiac arrhythmias/dysrhythmias and also tumours of the sympathetric nervous system (neuroblastoma, ganglioblastoma and ganglio­neuroma) and these should be screened for at regular intervals . The diagnosis in infants is most usually made on a neonatal unit when an infant repeatedly fails extubation despite no apparent lung disease, or coexisting neuromuscular or cardiac pathology. Infants with CCHS will require lifelong ventilatory support during sleep which can be delivered noninvasively (noninvasive positive pressure ventilation (NIPPV)) or via tracheostomy . It is known that the NDN (necdin) gene is deleted in children with Prader–Willi syndrome. In a mouse model, knockout of the NDN gene led to abnormal development of the pre-Bötzinger ­complex and a respiratory phenotype with ­abnormal breathing and prolonged central apnoeas . Furthermore, Prader–Willi syndrome patients are reported to have blunted responses to hypoxia and hypercapnia and abnormal chemo­receptor sensitivity. Prader–Willi syndrome infants appeared to have greater respiratory stability on oxygen , and it may be that by eliminating hypoxia as a causal factor in the cascade by which central events are generated, central event frequency is thus reduced. Joubert’s syndrome is a condition that results in hypoplasia of the cerebellar vermis and the brainstem. This condition may exert effects on temperature control, heart rate variability and also breathing, with a pattern of tachypnoea/apnoea classically being described that may result in profound central apnoeas . Similar tachypnoea/apnoea patterns along with cerebellar and brainstem anomalies have been reported in some of the oral–facial–digital syndromes. Hypoventilation is the failure to maintain normal gas exchange. Hypoventilation in infancy may have a central cause such as CCHS [44, 45], or occur as a result of the compressive effect on the brainstem of an Arnold–Chiari malformation  or a brain tumour. Hypoventilation in infancy may also occur due to peripheral muscle weakness and an inability to meet ventilatory requirements. Ex­amples include myopathies, congenital muscular dystrophies, myotonic dystrophy and spinal muscular atrophy. Hypoventilation in infancy may also arise due to muscle fatigue (congenital myasthenia ­gravis and congenital myasthenic syndromes) or be due to peripheral nervous system disease (e.g. hereditary sensorimotor neuropathy). Finally, severe upper airways obstruction may result in ­obstructive hypoventilation during sleep in infancy. The identification of hypoventilation relies on sleep studies along with capnometry. Measures of airflow, effort, SpO2 and carbon dioxide tension (transcutaneous or end-tidal) allows quantification of the degree of hypoventilation present. The treatment aim for infants with hypoventilation is to restore normal gas exchange, with sleep diagnostics playing a key role in the titration of ventilatory support (bilevel NIPPV or tracheostomy ventilation) needed to normalise SpO2 and carbon dioxide. The level of ventilatory support needed will vary, with some of the above conditions requiring 24-h a day support and others (e.g. milder phenotypes of CCHS) requiring support during sleep only. There is a wide range of normality in infant sleep with variability in sleep patterns, ­normative saturations and respiratory control. Infants are especially vulnerable to sleep disordered breathing and its consequences due to their upper airway structure, their lung mechanics (low FRC), their tendency towards REM sleep predominance, and their immature and variable ventilatory control. Which of the following management strategies can be used in infants with PRS and OSA? What is the optimal management strategy for an infant with nocturnal hypoventilation secondary to congenital muscular dystrophy? The authors thank Sadasivam Suresh (Lady Cilento Children’s Hospital, Brisbane, Australia) and Lizzie Hill (Royal Hospital for Sick Children, Edinburgh, UK) for help in supplying images to support the writing of this article. , eds. A manual of standardized terminology, techniques and scoring system for sleep stages of human subjects. Los Angeles, BI/BR, 1968. The AASM Manual for the Scoring of Sleep and Associated Events: Rules, Terminology and Technical Specifications, Version 2.2. www.aasmnet.org Darien, American Academy of Sleep Medicine, 2015.
. A manual of standradized terminology: Techniques and criteria for scoring states of sleep and wakefulness in newborn infants. Los Angeles, Brain Information service/Brain Institute, 1971. The neurological examination of the full term newborn infant. In: Clinics in Developmental Medicine, 12. London, Spastics Society and Heinemann, 1964.
. Sleep in infants. In: Guilleminault C, ed. Sleep and its disorders in children. New York, Raven Press, 1987.
. Development of states in infants. In: Clemente CD, Purpura DP, Mayer FE, eds. Sleep and the maturing nervous system. New York, Academic Press, 1972.
. Development of sleep in infants and children. In: Sheldon SH, Ferber R, Kryger MH, Gozal D, eds. Principles and practice of pediatric sleep medicine. 2nd Edn. Elsevier Saunders, 2014.
. Developmental changes in sleep and breathing across infancy and childhood. Paediatr Respir Rev 2015; 16: 276–284. Periodic breathing in infants with history of prolonged apnea. Am J Dis Child 1981; 135: 1029–1031.
. Periodic breathing and apnea in preterm infants. II. Hypoxia as a primary event. Pediatrics 1972; 50: 219–228. Effect of supplemental oxygen on sleep architecture and cardiorespiratory events in preterm infants. Pediatrics 2002; 110: 884–888. Oxygen saturation profile in healthy preterm infants. Arch Dis Child Fetal Neonatal Ed 2011; 96: F339–F342. Longitudinal assessment of hemoglobin oxygen saturations in healthy infants during the first 6 months of age. Collaborative Home Infant Monitoring Evaluation (CHIME) Study Group. J Pediatr 1999; 135: 580–586. Nocturnal oxygen saturation profiles of healthy term infants. Arch Dis Child 2015; 100: 18–23.
. Sleep-disordered breathing and its effects on sleep in infants. Sleep 1996; 19: 4–12. Oxygen saturation and breathing patterns in children. Pediatrics 1993; 92: 686–690. Polysomnographic characteristics in normal preschool and early school-aged children. Pediatrics 2006; 117: 741–753.
. Normative values of polysomnographic parameters in childhood and adolescence: cardiorespiratory parameters. Sleep Med 2011; 12: 988–996. Reference values for sleep-related respiratory variables in asymptomatic European children and adolescents. Pediatr Pulmonol 2007; 42: 159–167. Comorbidities in infants with obstructive sleep apnoea. J Clin Sleep Med 2014; 10: 1213–1216. Obstructive sleep apnea in infancy: a 7-year experience at a pediatric sleep center. Pediatr Pulmonol 2014; 49: 554–560. Prevalence of sleep-disordered breathing in patients with Beckwith-­Wiedemann Syndrome. J Craniofac Surg 2014; 25: 1814–1817. García Hernández G, et al. Screening for symptoms of obstructive sleep apnea in children with severe craniofacial anomalies: assessment in a multidisciplinary unit. Int J Pediatr Otorhinolaryngol 2012; 76: 1767–1770. The successful use of the nasopharyngeal airway in Pierre Robin sequence: an 11-year experience. Arch Dis Child 2012; 97: 331–334. Understanding obstructive sleep apnea in children with CHARGE syndrome. Int J Pediatr Otorhinolaryngol 2012; 76: 947–953. Obstructive sleep apnea due to adenotonsillar hypertrophy in infants. Int J Pediatr Otorhinolaryngol 2003; 67: 1055–1060.
. Sleep-disordered breathing and school performance in children. Pediatrics 1998; 102: 616–620. The effect of chronic or intermittent hypoxia on cognition in childhood: a review of the evidence. Pediatrics 2004; 114: 805–816. van den Heuvel CJ, et al. Adenotonsillectomy and neurocognitive deficits in children with sleep-disordered breathing. PLoS One 2009; 4: e7343.
. The significance of sleep onset and slow wave sleep for nocturnal release of growth hormone (GH) and cortisol. Psychoneuroendocrinology 1988; 13: 233–243. Diagnosis and management of childhood obstructive sleep apnea syndrome. Pediatrics 2012; 130: e714–e755.
. Supraglottoplasty for laryngomalacia with obstructive sleep apnea. Laryngoscope 2008; 118: 1873–1877. Modified nasopharyngeal tube placement for upper airway obstruction. Arch Dis Child 1999; 80: 186–187. Management of bilateral choanal atresia in the neonate: an institutional review. Int J Pediatr Otorhinolaryngol 2004; 68: 399–407. Characterization of obstructive sleep apnea before and after tongue lip adhesion in children with microganathia. Cleft ­Palate Craniofac J 2012; 49: 21–26.
. Mandibular distraction in neonates: a strategy to avoid tracheostomy. Plast Reconstr Surg 2002; 109: 896–904.
. Obstructive sleep apnea in infants. Am J Respir Crit Care Med 2012; 185: 805–816.
. Epidemiology and management of Pierre Robin Sequence in East Scotland: 10-year retrospective review. Eur Respir J 2014; 44: Suppl. 58, P1249. Central sleep-disordered breathing and the effects of oxygen therapy in infants with Prader-Willi syndrome. Arch Dis Child; 2013; 98: 592–595.
. Congenital central hypoventilation syndrome in children. Paediatr Respir Rev 2011; 12: 253–263. Arnold Chiari type 1 malformation presenting with sleep disordered breathing in well children. Arch Dis Child 2006; 91: 342–343.
. Methylxanthine treatment for apnoea in preterm infants. Cochrane Database Syst Rev 2010; 12: CD000140.
. Sleep stage, hypoxia and periodic breathing in the neonate. Acta Paediatr Scand 1991; 80: 763–769. An official ATS clinical policy statement: congenital central hypoventilation syndrome: genetic basis, diagnosis, and management. Am J Respir Crit Care Med 2010; 181: 626–644.
. Mask ventilation in the early management of congenital central hypoventilation syndrome. Arch Dis Child Fetal Neonatal Ed 2008; 93: F400–F403. Developmental abnormalities of neuronal structure and function in prenatal mice lacking the prader-willi syndrome gene necdin. Am J Pathol 2005; 167: 175–191.
. Joubert syndrome associated with severe central sleep apnea. J Clin Sleep Med 2010; 6: 384–388.